While at the Marx Is Muss 2016 conference earlier this month, Anja Ilic and Pavle Ilic (Marx21) interviewed Stathis Kouvelakis, a member of a party called Popular Unity, which split from Syriza last summer after the referendum. 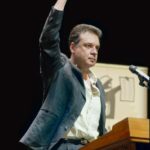 Kouvelakis served at Syriza’s central committee from 2012 to August 2015 and is also a professor of political theory at King’s College in London. This conversation focuses on the political and social situation in Greece today. Syriza Party leader Alexis Tsipras greets supporters at a party rally in Athens. The leftist party came second in the elections last month and could win a revote on Sunday. I would like to start by asking you to summarise the political and social development of the Greek society after the events of August 2015, after the capitulation of Syriza to the Troika, because at that exact time the worldwide media stopped covering the situation in Greece almost completely. The Serbian public in particular – I don’t think they have any information on Syriza apart from its capitulating to the forces of the Troika. The first thing which we have to say is that this memorandum started being implemented immediately after being signed – or, rather, immediately after the elections of September 20. It had been, prior to that, approved by the previous Greek parliament by over 90% of the votes, which shows how, you know, democracy has been in a way destroyed in Greece. The measures of this memorandum can be divided into two parts. The first is a further package of austerity measures. This further package includes pension reform, further taxation, budgetary cuts, but it also includes sorting out the issue of the “bad loans” and it also included the recapitalisation and, actually, privatisation of the Greek banking system. The second part of the memorandum has to do with more structural changes affecting the Greek state, and actually dismantling what was left of its national sovereignty. What I mean by this is that the new memorandum pushes even further the autonomisation of one of the central state agencies, which is the Secretariat for Revenue – the agency collecting the taxes – which has now become a fully autonomous institution, and the appointment of its head has to be approved by the lenders. So, it’s actually under direct control of the lenders, and not under the control of any elected Greek government anymore. Another one is the Council for Budgetary Discipline, which can also take decisions that don’t need to be passed in parliament, not even in the cabinet, and which will automatically implement cuts if they consider that there is a risk that the fiscal targets set by the memorandum will not be met. And this is how the mechanism, this extra package of 3.6 billion Euros of further cuts on top of the 5.6 that have already been approved will be completely implemented in 2018 at the latest. The bill voted by the parliament institutes an automatic fiscal adjustment, which the Greeks have named “the cutter”, that will implement those 3.6 billion of cuts in 2018 if the 3,5% of primary surplus isn’t met, which is 100% certain given that Greece is sinking in recession. Also, the Greek assets, the remaining assets in the hands of the Greek state will be sold, and some of them have – or the most important ones have – already been sold at very low prices. The Port of Piraeus has been sold to a Chinese company, as have many other ports. Fourteen airports have been sold to Fraport, a German company of which the Land of Hessen is the main shareholder; the coastline will be very heavily privatised, and so on and so forth. Furthermore, the remaining infrastructure, water companies and electricity – what’s left in the hands of the state – is planned to be privatised very quickly and at very low prices. So, if we put these two things together – and this is a comparison I have already made – I think that Greece is becoming something like a bigger Kosovo – a half protectorate in which the formally elected government controls very little and actually has very little power in the country. Greece is in a situation of protracted limited sovereignty, in which, in fact, the Troika monitors absolutely everything that is done in the country. What the government has tried to do, in order to manage, as much as possible, politically speaking, the situation is the following: they have tried to win time concerning the measures that affect, most directly, the income of the people. So, they have tried to delay, as much as they could, the reform of the pensions, for instance, because they know that the effects will be absolutely devastating. They have tried to delay, as much as possible, the issue of the loans, because they know that the image of homes being repossessed by banks and people being kicked out, like in Spain, on a great scale, will be absolutely devastating for them. Thus, they prioritise privatisations, recapitalisation of banks, structural reforms, because it doesn’t affect in the same way the income of the people directly. But, at the end, they had to vote that reform, it was passed in Parliament on May 8, together with the bill raising direct and indirect taxation, and the rest of the measures of the austerity package will be passed before the next Eurogroup meeting, on May 24. As a result of that relentless austerity, the overall economic and social situation is continuously deteriorating. Greece is still in a recession – which is the biggest recession in Europe since the 1930s – unemployment is sky-rocketing, young Greek people leave the country by hundreds of thousands, public services are collapsing, especially in the health sector and the education, so, the picture is absolutely disastrous, but the government has been staging for months a kind of pseudo-confrontation, a kind of farcical repetition of what has happened last year, in order to show that it is trying to do as much as it can to soften up the blows and to limit the damage as it were. Now they just celebrate the agreement of the May 10 Eurogroup meeting, presenting it as some kind of success although they had to satisfy 100% of the demands of the Troika. Talking about what the government is doing and what it did, and going back to August 2015, there were different reactions from the left about what really transpired then. In your opinion, was it a structurally necessitated implosion of Syriza and of its programme; was it, on the other hand, the defeat of forces pitted against each other; was it treason on part of Alexis Tsipras and his clique… what happened in August 2015? I think that the most relevant term is defeat – a defeat of the whole strategy and of the whole approach. This doesn’t mean that, for instance, inside Syriza – and Syriza was a heterogeneous formation, as it became even more clear after that moment – there were sectors that from the outset were oriented towards, let’s say, capitulation, or finding a deal, brokering a deal with the domestic dominant class and with the EU at any cost, whatever that meant – there was no red line, actually, for that; they were vaguely talking about, you know, compromise – but actually very little substance was ever given to what could be the basis or the minimal ground for such a compromise. So, it is the defeat of an approach that essentially believed that it is possible to break with austerity and neoliberalism within the framework of the European Union, and more particularly, of the Eurozone. 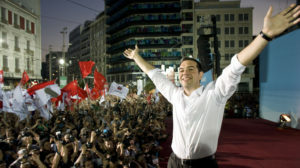 This belief, which I have called “left Europeanism”, completely disarmed both the government and prevented it from reacting properly when the attacks and the blackmail of the European Union started, but it also politically disarmed Syriza because it didn’t prepare the people, the population, and the party itself, actually, to the real confrontation and to what was happening. So, Syriza bears an enormous responsibility for this. This approach has been now defeated and the European left needs to draw the lessons from that. It also needs to draw the lessons of a strategy that just lacks realism; I mean, we have to understand that in certain situations the realism is on the side of those who are thinking about the confrontation and seriously considering the means necessary to win over such the confrontation, because we know that the adversaries are ruthless and they won’t step back voluntarily. If we are not ready to confront them and to do whatever it takes to implement targets that are clear, that have won the majority of the people, that are accepted in a way as commonsensical, necessary measures, then, inevitably, we will transform a big hope, a big movement into a disaster, and into a defeat. You were known to mention that the radical – actually, the anti-capitalist left didn’t automatically gain strength from the defeat of the Syriza government, and the Syriza tactic. What about the right wing of the Greek society? Did it benefit in any way from the defeat of Syriza, which structures benefited – did the Golden Dawn or any new fascist outlets find their way around the crisis? First of all, let me clarify one point – for me, perhaps not the entire Syriza, but the anti-capitalist left includes currents that were part of Syriza. I don’t restrict the anti-capitalist left to the far left organisations that stayed apart from that project. I think that this is something we’ll have to keep in mind that there is, as of yet, no political crystallisation of the anti-capitalist left in Europe. We can find currents, people, political tendencies that are anti-capitalist in many different organisations and frameworks, in parties, campaigns, trade-unions and so on. In answer to your question, yes, the right has benefited, obviously, because it has been vindicated in one of its crucial principles – that there was no alternative. And, basically, this is how Tsipras tried to justify the capitulation; he said that, you know, there was no alternative because breaking with the EU and exiting the Europe, which would be the immediate consequence, announce to a “collective suicide”. Euclid Tsakalotos, the successor of Varoufakis as finance minister, a few weeks before the capitulation, when he was asked what an exit from the euro would mean, said it would be the return to the 1930s and to the last period of the Weimar Republic. Therefore, he compared exiting the Europe with Nazism – why not the concentration camps, in that same logic. These people had completely ruled out, actually, the perspective of the break and of the rupture. And by doing so they were trapped in the logic that was leading to defeat. The right has won the battle of “TINA” at the level of public opinion, and this is very important. Now, this leaves only two possibilities – it can be something radical further on the right, that will appear as an anti-establishment force. This remains a potential threat; it hasn’t realised yet, according to opinion polls and to the feeling we have. Golden Dawn remains stable, but stable at the significant level, so it is still a possible threat. Alternatively, it can be a radical proposal on the side of the left, but time is needed for that. A new political cycle has started and a whole set of experiences are necessary and need to be accumulated for us to achieve something that is qualitatively superior to the state of weakness, in which we find ourselves now. Maybe a short comment linked to this – the EU–Turkey deal as a very important macro political happening for the continent in the last few weeks – did it affect the Greek society in any way? Yes, of course. Well, the whole issue of the so-called “refugee crisis”, or the refugee question, rather, because naming it as a crisis is always biased, according to me; I don’t consider the arrival of refugees in Europe itself as a problem, and, therefore, as a reason for a crisis. So, yes, it has affected Greece because it has made it clear that Tsipras is just obeying what he’s told to do by the European Union and that he has completely betrayed his principles. He didn’t react to the closing of the borders. He accepted it as something that has happened, as a de facto situation, which is contrary to every kind of principle, even those of the completely rotten EU. So, he is completely manipulated by Merkel and by the European Union, who want to transform Greece into a trap for migrants and to make it collaborate with Turkey, with NATO patrolling now the Aegean, in order to be the policeman of Europe, in order to be the bodyguards of Europe. And Tsipras has accepted to play this role, once again totally betraying the principles and the policies for which he was committed. 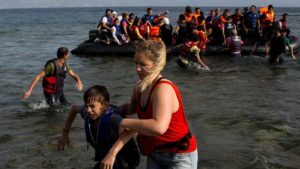 These policies, at least before last summer’s capitulation, included opening the borders, allowing the free circulation of migrants, welcoming and providing decent conditions for the migrants and the refugees during their stay in Greece. There was the illusion on a part of the left that, okay, we made concessions and tough concessions on the economic level, but we will remain firm on the question of moral values and on human rights, and we’ll show that we have remained left wing on that terrain. This is a complete illusion and I think that Tsipras’s capitulation to this is a further proof that you cannot dissociate the two levels. And as a final question: in this situation which is obviously not very inspiring or optimistic, do you see a way forward for the Greek left, and is that way forward independent of the happenings on the continent, if we can call it so, or will it have to include stronger connections to left wing forces and left wing movements all over Europe, and, basically, all over the world, if you’ll forgive the loaded question? First of all, I think that the whole European and international left needs to draw seriously the lessons of what happened in Greece, at all levels. It starts, of course, with the issue of the European Union, and that you cannot spend the rest of your time just repeating the mantra about a social Europe, a better Europe, about reforming the European Union… We have seen that these things do not work. And I think that the debate at the European level has started with the initiatives about plan Bs – that’s one thing. The second thing, of course, which concerns Greece, is that the way to go forward, I think, is also for us to draw the lessons of what has happened and to think about the new situation that has been created now. The insufficiencies of what we have tried to do before, which include Syriza, but also go beyond it, have to do with the question of strategy, but they also have to do with the question of the type of organisation we want to build. Personally, I don’t think that the perspective of broad parties is outdated; I think that there is no other way to go ahead than trying to regroup our forces. Otherwise, we will just end up reproducing sectarian divisions. But, the lesson of Syriza is that we need to have a sufficiently articulated strategic common ground that is really shared by the forces committed to that project. Otherwise, the inner contradictions will blow up at some point and lead to the type of disasters we have seen happening in Greece. A Serbian version of this interview has been published on the Marx21.info platform. Anja Ilic and Pavle Ilic are sociology students and members of Marx21. It would be nice if Stathis could take a more active role in the current Brexit debate, if only to pour some cold water on the apparently unfalsifiable Europeanism of Varoufakis.